Following years of civil unrest, Sri Lanka is now finding its feet as an influential country in South Asia for trade. Sumudhu Jayasinghe looks back at how 2016 shaped Sri Lanka’s emerging economy, and what it means for the region going forward. Sri Lanka, though a small island state, lies at the tip of the South Asian subcontinent and at the center of the Indian Ocean. In a vastly interconnected world, the sweeping effects of globalization; China’s economic downturn; growing discontent and de-stabilization in the West; and India’s enhanced involvement in the region as an emerging power, have all been major thrusts of global politics in 2016. Sri Lanka remains at the center of it all, enjoying great geostrategic importance, owing to its deep harbors and trade-friendly location. A review of 2016 suggests that in the coming year Sri Lanka’s domestic and foreign policy decisions will likely continue to have an increasing impact on the broader dynamics of Southern Asia as a whole. 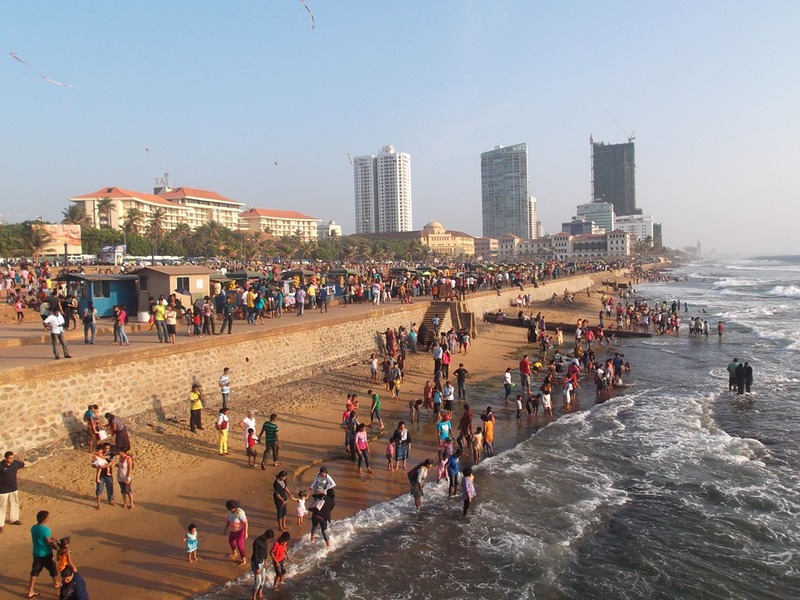 Perhaps the most significant decision taken by Sri Lanka in 2016 was in relation to recommencing construction of the Chinese-funded Colombo Port City. The port city project, initially halted after the change in regime, is now back on after several protracted negotiations. Envisioned as a $1.4 billion financial center of skyscrapers, luxury hotels, shopping malls, and a marina, it gives China a lease on 110 hectares of the port city for 99 years (2/5 th of the project area), and attempts to fill the gap of a financial hub between Dubai and Singapore. By some accounts, it is expected to be a “quasi extra-territorial zone” with its own laws and authority to offer favorable trade, investment, and tax policies. These port cities have become indispensable as logistical centers to handle greater volumes of people, cargo, and trade than ever before. They are expected to attract volumes of tourism and create new employment opportunities across different sectors. Moreover, just last month, an agreement was made in principle to sell an 80% stake of the Hambantota deep-water port to a Chinese state-owned company. This port is located to the south of Sri Lanka, and lies close to one of the world’s busiest sea-lanes. Within the region, India has been growing concerned about an increasing Chinese presence in Sri Lanka, including the re-commencement of the port city, and the projected sale of stakes in another port, along with the docking of two Chinese submarines in the recent past. As the relationship between Sri Lanka and China continues to grow, we can only assume what ramifications it will have on geopolitical balances in the region, and the geostrategic interests of the multiple powers interested in the Indian Ocean region. Simultaneously, it is critical to remember that China remains one of India’s greatest trade partners. In 2015, Sri Lanka co-sponsored a resolution at the United Nations Human Rights Council, committing itself to promoting reconciliation, accountability, and human rights post-conflict. Several domestic policies, mechanisms, and developments have manifested in the past year to implement this commitment. The passage of legislation for setting up the Office of Missing Persons and wide public consultations on constitutional reform and reconciliation mechanisms were key developments in 2016. Another milestone was the passing of the Right to Information Act, the result of a two-decade long campaign of civil society and media activists, ensuring that the right to information is finally a reality all across South Asia! Though liable for critique for their respective shortcomings, these changes have contributed positively towards Sri Lanka’s image globally. Most recently, the Millennium Challenge Corporation (MCC), an independent U.S. government agency, selected Sri Lanka for a new MCC compact (five-year grant) to encourage economic growth and reduce poverty. The criteria for the above grant calls for the demonstration of “a commitment to just and democratic governance, investments in its people, and economic freedom.” Similarly, the inaugural U.S.-Sri Lanka Partnership Dialogue, held in February 2016, implies a positive shift in Sri Lanka’s relations with the West. The multiplier effect of this, on the rest of South Asia, relates to the aforementioned improvement in trade and investment. In a globalized word, cooperation like this contributes towards greater collective prosperity for the region. Despite shared interest in regional economic development, however, regional cooperation and the role of the South Asian Association for Regional Cooperation (SAARC) continues to falter due to various deep-seated conflicts and tensions. Despite the existence of the South Asian Preferential Trade Agreement (SAPTA) and South Asian Free Trade Agreement (SAFTA), inter regional trade remains as low as 5% in South Asia. The recent indefinite postponement of the 19th SAARC Summit speaks to this. A boycott of the summit to be held in Pakistan, initiated by India, was endorsed first by Bangladesh and Afghanistan. Sri Lanka became the fifth nation to endorse the postponement, echoing the idea that until a more conducive environment is fostered, the pursuit of regional cooperation will be limited. The question therefore remains what implications these decisions, in the broader global context, will have on the future of SAARC and the region. 2016 also marked negotiations regarding the Indo-Sri Lanka Economic And Technology Cooperation Framework Agreement (ETCA). Although the agreement has not yet been finalized, it remains widely controversial in Sri Lanka. The agreement promises trade in services and technology in sectors such as IT and shipping, also enabling movement of professionals back and forth. However, this has implications both in terms of providing job opportunities and in augmenting competition. It remains to be seen whether this agreement will truly stimulate growth and trade for the region. Finally, the past year also saw Sri Lanka restarting negotiations to regain Generalised Scheme of Preferences (GSP) Plus status, after the EU withdrew these benefits in early 2010, following the end of the civil war. GSP with the EU is significant because nearly 30 percent of Sri Lanka’s exports go to the European Union (EU), and it accounts for 43 percent of Sri Lanka’s apparel exports while also being a leading market for fishery products, coconut products, cut flowers and foliage. However, both Pakistan and Bangladesh, who are Sri Lanka’s direct competitors, particularly in terms of apparel, currently benefit from the EU’s special concessions and incentive plan but Sri Lanka doesn’t. The possibility of regaining GSP Plus from the EU is closely linked to shifts in Sri Lanka’s foreign and domestic policies. While confidence is strong that increased growth for Sri Lanka will have positive effects on the rest of the region, the question of competition may also prompt cause for apprehension, particularly in light of growing concerns over economic instability and regional competition. More than ever, it is apparent that whilst maintaining its strategic interests, for the shared prosperity of the region, Sri Lanka’s policies and decisions need to be articulated in a manner that transcends boundaries and fittingly balances the multiple actors and interests circling its waters. Sumudhu Jayasinghe is currently a Research Officer at the Regional Centre for Strategic Studies. She holds a BA in Political Science/International Relations from Sarah Lawrence College and a MSc in Development Studies from the London School of Economics and Political Science. She has previously worked as a Researcher/Programme Officer at the International Centre for Ethnic Studies, and on several independent consultancies. Her interests straddle the social sciences; focusing on the intersection between governance, development, law, and society, specifically within Sri Lanka and across South Asia. This article was first posted on South Asian Voices.